I have to say I really like these Nail Art Pens, what won me over is that is is a nail polish and pen. So you can do your nails and then pop off the top and see the pen part to do the nail art. You can definitely be very creative with these. Here you can see the colors I received, It was definitely an assortment for the fall. I'm in Chicago so the middle of winter with these colors was not the best lol. At first I thought I had to press on the pen part to get the color out but all I had to do was press lightly on the tube and voila, just be careful not to press to hard or you will get too much polish out. The polish and Pen side is genius and I like the duo ends as well. I will definitely look forward to trying out more of their colors. These are simple yet eye catching that would be easy to try with these Nail Art Pens. 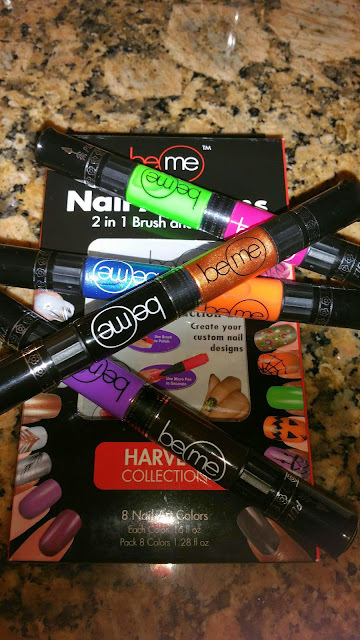 BeMe™ Nail Art Pens are unique pen/brush tools allowing you to brush on a base color and then create amazing works of art with the revolutionary pen tip. 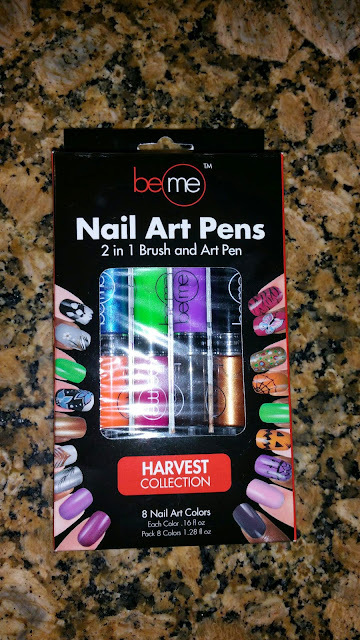 You can get these at Nail Art Pens online at BeMe . Let me know what you think of these Pens and What Nail Art you are looking to try. I love bold bright nails any time of the year! your nail art is so simple yet elegant, love!